Amid speculation about Iran's growing influence in the Middle East, Saudi Arabia-backed forces made major gains against the Houthi rebels aligned with Iran in Yemen this week. 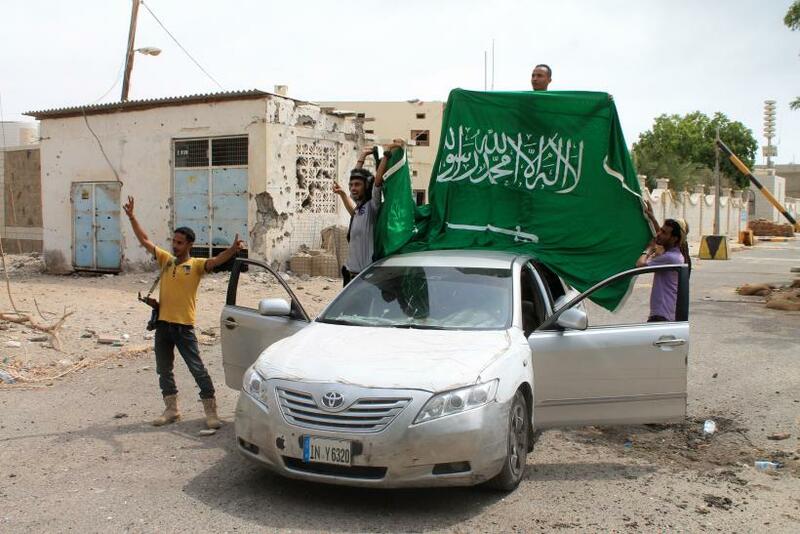 Militias seized nearly all of the port city of Aden from the Houthi rebels on Thursday. "Operation Golden Arrow" began Tuesday, just as the United States signed a nuclear deal with Iran, the Houthi rebels' biggest ally. Several top members of Yemen's Saudi and U.S.-backed government returned to Aden on Thursday, Reuters reported. The delegation reportedly was chosen by exiled President Abed Rabbo Mansour Hadi, who is now in Saudi Arabia. This could signal preliminary efforts to reinstate the government the Houthis forced into exile three months ago. Hadi sent the ministers to "prepare the security situation and ensure stability ahead of a revival of the institutions of state in Aden," a local official told Reuters. For this particular operation, the coalition provided the Popular Resistance militias in Aden with armored vehicles from the United Arab Emirates and 300 additional troops, according to a report from the Critical Threats Project of the American Enterprise Institute (AEI). "The Houthis responded by attacking Aden's airport with rockets on Wednesday and may be consolidating forces as reports say they are withdrawing from front-line locations," according to AEI. "The move may be in preparation for a counteroffensive against Aden from the north." The Saudi-led coalition includes mostly Gulf countries, but the United States has also been providing military and intelligence support. The Houthis are fighting alongside forces loyal to former Yemeni dictator Ali Abdullah Saleh and Tehran's influence has grown since the beginning of this year. Some are wary that Iran's influence will increase after the nuclear deal. Critics of the deal believe that some of Iran's newly accessible funds will go to strengthen its proxies in the region, like the Houthis, which could threaten American allies' interest in the region. That said, it is unlikely that the Houthis would have received any significant reinforcements resulting from the deal so soon after it was signed. Others believe that the new American agreement with Iran will open communication lines between the two countries and American allies. "Yemen is a perfect example," said Suzanne DiMaggio, a senior fellow and director of the Iran Initiative at New America, a nonprofit American policy think tank. "We should begin the conversation now about how Iran can play a constructive role in bringing the Houthis to the negotiating table to bring about some political settlement." The Houthis seized Yemen's capital Sanaa last year and forced the Saudi and U.S.-backed Hadi to step down. Hadi fled to Saudi Arabia in March, just hours before the first Saudi-led coalition airstrikes hit Houthi strongholds. Since then, violence in Yemen has killed more than 3,000 people.